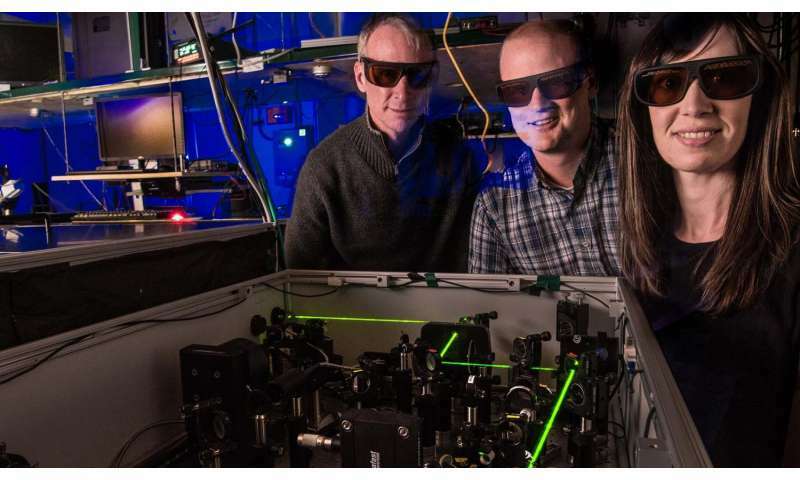 Paul King, David Mulder and Cara Lubner, co-authors of the paper “Mechanistic Insights into Energy Conservation by Flavin-Based Electron Bifurcation,” stand next to a laser coupled with a spectrometer able to measure very fast processes. Credit: Dennis Schroeder, NREL. For all living things to succeed, they must reproduce and have the energy to do so. An organism's ability to extract energy from its surroundings-and to do it better than its competitors-is a key requirement of survival. Until recently it was thought that in all of biology, from microbes to humans, there were only two methods to generate and conserve the energy required for cellular metabolism and survival. Now researchers have discovered a third method of microbial energy production, called "flavin-based electron bifurcation" (FBEB). This newly found method is actually an ancient form of energy generation and conservation but is so different from the known processes that it represents a paradigm shift in how scientists think about the way organisms obtain energy. The mechanism of how FBEB works was unknown-that is, until a breakthrough was made by researchers from the Biological Electron Transfer and Catalysis (BETCy) Energy Frontier Research Center, whose members include Cara E. Lubner, David W. Mulder, and Paul W. King from the U.S. Department of Energy's National Renewable Energy Laboratory (NREL). The team examined previously unknown features of the catalytic mechanism, gaining critical, comprehensive insights about the way in which FBEB works. One of the most important findings is how a unique flavin molecule is able to generate two levels of energy from a single precursor compound. One level is used to perform an easy chemical reaction, whereas the other much more energetic one is used to perform more difficult chemistry to form a high-energy compound. In doing so, the two reactions are coupled together so that energy that is normally wasted is conserved in the high-energy compound. FBEB allows an organism to get more energy "bang for its buck," and the key player is the unique flavin that enables the enzyme to perform energy conserving chemistry unlike any other that has been studied. The research brings a new understanding of electron bifurcation and sets a model of the underlying mechanistic principles by which they function. "The results should enable new strategies for engineering biological systems for more efficient production of fuels and chemicals and for developing catalytic processes that optimize conversion of electrochemical reactions," said NREL researcher Cara Lubner. "Understanding the biochemistry of bifurcation will enable more informed strategies for bioengineering microbes to produce higher levels of biofuels and reduced chemicals." Details of the study can be found in the article "Mechanistic insights into energy conservation by flavin-based electron bifurcation" in the journal Nature Chemical Biology. The article was authored by members of the BETCy, who are located at NREL, Montana State University, Arizona State University, the University of Georgia, and the University of Kentucky. "As we better understand the bifurcation method, we envision that new materials and catalysts might be designed that have the same increased efficiency at the important chemistries they perform," noted NREL scientist David Mulder. One potential result is fewer by-products from catalytic processes (by-products are usually the consequence of energy inefficient processes) and therefore savings on materials and money spent on industrial processes. It may also be possible to take advantage of these energy-efficient pathways inside living cells by engineering microbes to preferentially use them to make better products such as chemicals, fuels, or hydrogen gas.